This weekend – June 28th and 29th- is Chiltern Arts Fest at Chiltern Open Air Museum, Chalfont St Giles. We will be Raku firing – hopefully in the Smithy again- on Saturday and Sunday between 10am and 5pm. Next weekend, July 4,5, and 6th, I will be at Hatfield House taking part in the Art in Clay exhibition. I will be in the Throw a Pot tent. 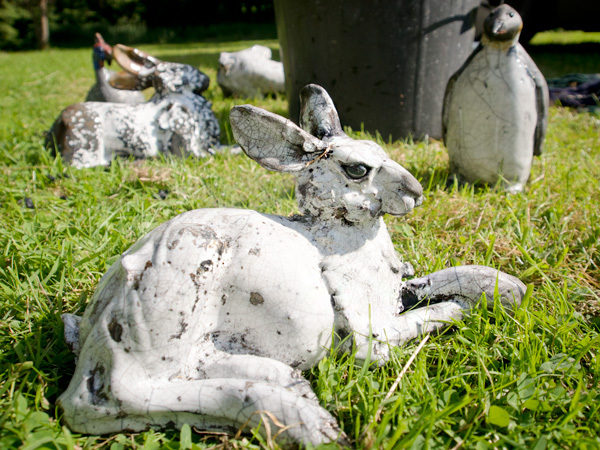 The hare sculptures have been very popular – here is an image of production in progress from the recent BoS event (the Raku “zoo”!). This entry was posted in Exhibitions on June 26, 2014 by Carol.